Small Dog Syndrome is the name given to a collection of behaviour displayed by small dogs, behaviours that have the effect of overcoming any deficits caused by being small in stature. The problem is reminiscent of a inferiority complex in humans. Typical behaviours displayed include:  excitable behaviour,  jumping up on owners, other people or dogs,  Growling at people or other dogs,  Lunging or snapping at perceived threats,  Avoidance or fear of larger dogs, typically hiding behind or trying to be picked up by owner,  Reluctance to move off sofas and beds,  Separation anxiety symptoms and  Failure to obey commands. This does not mean that every small dog will display these behaviours, or that each of these behaviours is indicative of Small Dog Syndrome. Collectively, however, these behaviours make life with small dogs difficult for owners and for other people and animals around them but there are ways of improving their behaviour. Changing dog behaviour generally involves changing owner behaviour too and, as some 'dog psychologists' believe, this syndrome may have more to do with the owner’s behaviour than their dogs! Understanding dog behaviour, and how humans affect it, is the first step in improving the negative aspects of Small Dog Syndrome. 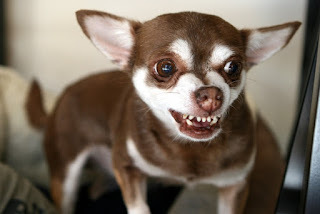 The question remains, however, why people want to own such a small dog with its known behavioural problems. Maybe they are kindred spirits.